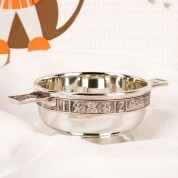 Engraved Pewter Baby Quaich. Presentation Boxed. Our beautiful engraved pewter quaich is a traditional Scottish gift, perfect for celebrating a baby boy or girl's special occasion. The edge and handles are decorated with a timeless baby theme – including teddy bears, ABC, 123, and various toys in between the letters and numbers. 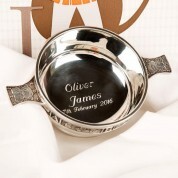 To make the gift an extra special keepsake, the baby's name and date of occasion are engraved inside the cup. It's a classic gift for the birth of a new baby, or for a special event such as their Christening or Baptism. It will sit proudly on display as a lasting memento of their day. Dimensions: Approx. 9cm diameter, approx. 14.5cm wide including handles. 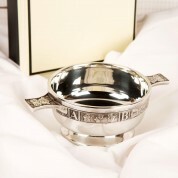 You're reviewing: Engraved Pewter Baby Quaich. Presentation Boxed.